Pattern designer, commercial tier, author, photographer, and instructor. If you haven’t heard of Drew Chicone, you will. Since the 1970’s, Fly Tyer magazine has been home to some of fly fishing’s brightest stars. This is the place they have turned to introduce new patterns, tying techniques, and materials. One of our greatest pleasures is introducing you to new tiers, those innovative people who are developing fresh flies and tying methods. Drew Chicone recently joined the Fly Tyer family of authors. I met Drew during a trip to Orlando, Florida, and immediately recognized he was someone who would make important contributions to fly fishing and tying. In fact, he is already making his mark in our sport as a fly designer, commercial tier, instructor, and author. Drew’s first contribution to this magazine, which was about a pattern he calls the Detonator Crab, appeared in the Winter 2014 issue. This Spring 2015 issue contains his feature article about a fly he calls the Tuscan Bunny. 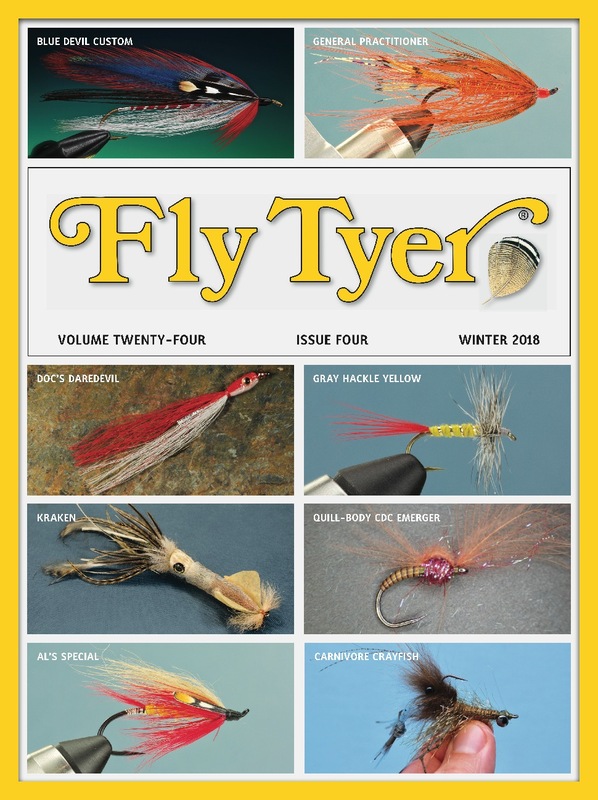 And, Drew has more assignments to write articles that will appear in future issues of Fly Tyer. We all follow a different path to fly fishing and tying. Many of us learn the sport from our parents—usually our fathers—but Drew’s dad and mom played an instrumental role in his development as a fly tier. Hook: Regular saltwater hook, size 6 or 4. Body: Orange tying thread and pearl Krystal Flash. Wing: Tan rabbit fur and silver-speckled clear Sili Legs. Your mother tied flies too? How did your parents get into fly tying? Your parents tied mostly trout flies? Although Drew cut his teeth tying flies and fishing for trout, he developed a desire to fish salt water. When presented with the opportunity, he moved to Florida. “I lived in Florida for about ten years, but now I live in Arizona. We moved here for my wife’s work. It’s a whole different flavor over here, but it hasn’t slowed down my saltwater fishing because I get to travel so much. I always wanted to live in Florida, and I got a job opportunity there. I was right out of college, and I took the job. Hook: Gamakatsu SC-15, size 2/0. Belly: White saltwater yak hair and pearl Wing N’ Flash. Back: White, tan, and yellow saltwater yak hair. Eyes: 8-millimeter clear doll eyes. When I look at Drew’s flies, they are terrific but simple. He creates his original patterns using a combination of natural and synthetic materials. What are the most important considerations when designing a new pattern? “I concentrate on how a fly moves in the water, but I also emphasize the sink rate. The sink rate is a huge factor of a successful fly. “The sink rate—where it rides in the water column—is probably the biggest consideration when I design a fly. For bonefish, permit, tarpon, and even snook, you want them to stumble upon the fly like they found it themselves; you don’t want to drop it on their heads. You need to lead the fish to the fly, and to do this you have to know how fast the fly is moving through the water column to put it on the dinner plate in front of them.